Positive Detroit: Is the Future of Cities Being Built in Detroit? Detroit was once the engine of America's automotive industry. Today it is a symbol of urban decay. But a daring bid to return the land to farming is sowing seeds of recovery – and could be a template for cities across the world. Strolling around his inner-city Detroit neighbourhood, Mark Covington pauses to take in the view. The houses and shops that existed when he was a child are gone, replaced by empty lots, the buildings either burned down or demolished. In their place is wilderness. Tall grass, wild flowers and trees. "Just look at that," he says. "It could be a country road." Such views are increasingly common all over Detroit, the forlorn former capital of America's car industry and now a by-word for calamitous urban decline. Once the fourth largest city in America, its population has shrunk from about 1.8 million at its peak in the 1950s to fewer than 900,000 now. Its streets are lined with an incredible 33,000 empty lots and vacant houses. City government is broke. The shells of dilapidated factories look out over an urban landscape that has been likened to New Orleans after Hurricane Katrina – except Detroit's disaster was man-made and took decades to unfold. Now the seeds of a remarkable rebirth are being planted – literally. Across Detroit, land is being turned over to agriculture. Furrows are being tilled, soil fertilised and crops planted and harvested. Like in no other city in the world, urban farming has taken root in Detroit, not just as a hobby or a sideline but as part of a model for a wholesale revitalisation of a major city. Some farms are the product of hardy individualists or non-profit community groups. Others, like Hantz Farms, are backed by millions of dollars and aim to build the world's biggest urban farm right in the middle of the city. Mark Covington, 38, is one of those 21st-century pioneers, though he stumbled on his role almost by accident. Finding himself unemployed after losing his job as an environmental engineer and living back with his mother two years ago, he started tidying up an empty lot near his Georgia Street home, planting vegetables and allowing local people to harvest them for free. An orchard of fruit trees followed, as did a community centre – made by converting a pair of empty buildings – which keeps local youths off the streets. The result is a transformation of the area around his childhood home. Local kids come to movie nights held amid the crops. Residents love the free, fresh food in an area where no major supermarkets exist. The Georgia Street Community Garden is never vandalised. Standing next to a freshly planted bed of onions, potatoes, garlic and collard greens, Covington is a genial soul with gentleness built into a giant physical frame that could play American football. As he walks his neighbourhood, it seems everyone knows his name and calls out hello. He seems unsure of whether or not he is at the forefront of a social revolution, but he does know that he has made a big difference to a part of the city where real improvements have been in short supply. "I just did what seemed like needed to be done," he shrugs. A familiar refrain from many of the thousands of people involved in urban farming in Detroit is that they are returning the city to its pre-industrial roots. Back in the late 18th century, Detroit was a small trading post surrounded by fields and farms. "You know, this area began as farmland and we are just going back to that," says Rich Wieske, who runs more than 60 beehives in inner-city Detroit and sells the resulting honey commercially. The middle-aged Wieske sports a white beard and a passion for his bees. What began as a hobby to provide honey for making mead has now turned into a profession. As he tends five of his hives, situated on a plot of land that used to house a grand brick mansion, but is now a pleasant patch of woodland, Wieske marvels at how suitable the environment of the inner city is for his tiny charges. Each year Wieske's apiary, Green Toe Gardens, produces about 3,000lb of honey and sells it in local Detroit markets. "Our harvests are as high as anywhere else in the US. There is so much forage, so much land for the bees," he says. Yet the fact remains that for the past 100 years Detroit was all about industry. It was where Henry Ford invented the production line, giving birth to the car industry. Detroit became the archetypal American 20th- century metropolis on the back of hundreds of huge factories, surrounded by solid middle-class houses and a thriving downtown filled with skyscrapers. It was a magnet for immigrant workers and produced vast industrial fortunes for grand American families, becoming a centre of culture and manufacturing where politicians could dream of one day rivalling New York. No more. The car industry faded, taking jobs with it. "White flight" saw neighbourhoods decay as the middle classes departed, ruining any chance of raising enough taxes for the city's upkeep. A once-wealthy, ethnically mixed city is now more than 80% black, with an unemployment rate believed to be as high as 50%. Since the 1970s there have been numerous efforts to stem the decline, either by trying to stop the car factories from leaving or by bringing in new industries, such as the massive casinos that have sprung up downtown. All have failed. Detroit is not being transformed by some massive top-down initiative, but by projects like the urban farm that has emerged on Linwood Street. It's a typical Detroit scene, with burnt-out shops, empty lots and houses, plus a few other buildings where residents are barely clinging on. It is busy with the roar of traffic, as well as the sound of a small John Deere tractor which is mowing the grass around a large plot of bare earth that has been prepared for planting. There are more bare fields on nearby lots. The smell of damp earth and fertiliser mingles with exhaust fumes. The Linwood Street urban farm is now in its fourth planting season, producing a bounty of corn, squash and potatoes for local residents to harvest, again for free. 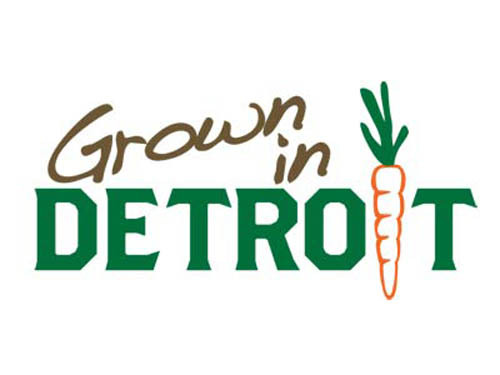 Developed by Urban Farming, which was founded by Detroit singer and former Prince protégé Taja Sevelle, the movement is dedicated to turning vacant land over to food production, providing a healthier diet to city people who either go hungry or have poor nutrition. Some of Urban Farming's projects, such as Linwood, are huge, spanning several city blocks and generating substantial amounts of food. Others, like planting single gardens on rooftops or creating "living walls", are small. 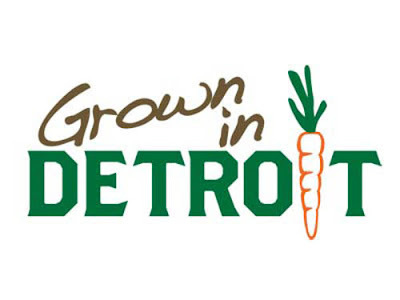 Last year alone the group oversaw the creation of 900 food gardens in Detroit. Some were in people's gardens, others on land donated to charities by local people or bought from the city. Sevelle sees what is happening as a harbinger of urban development for the western world's declining inner cities, with Detroit at the cutting edge of the phenomenon. "I see the entire world looking different. Detroit will be number one in showing people how to pull a city out of a situation like this," she says. Not that such grand thoughts are a concern to Linwood Street residents such as William Myers, a 70-year-old retired General Motors worker. He just knows that the crops sprouting from the fields that have unexpectedly sprung up on his street are feeding many of his poor neighbours. As with many community or charity-run farms, the food is simply available free to residents. When it is ready they can come and harvest it straight from the ground themselves. Such a scheme might seem a recipe for chaos, but vandalism on the city's urban farms is almost unknown. They are unfenced, open to all, and run by volunteers or charity workers. It is hoped that residents who eat the food will also help to grow it. But there are no set rules. "It's beautiful," Myers says. "There's a lot of people around here who really need it, and they say it tastes very good." Agriculture has long existed in the nooks and crannies of urban life. Market gardens, allotments and backyard plots have always helped provide extra nourishment for city dwellers. That's certainly the tradition that Patrick Crouch sees himself following. A red-haired man dressed in T-shirt and jeans, he is working hard in the late-spring sunshine. "Mind the asparagus!" he calls out as he pushes a hand plough through the soil of the Earthworks Urban Farm. Situated in one of Detroit's most deprived areas, it provides food for a soup kitchen, which is run by Capuchin monks and is vital for the neighbourhood's poorest residents. "I think there is a historic context to this," he says. "There is a long history of urban farming. I look for inspiration to the Parisian market gardens of the 19th century." Crouch, who has a background in agricultural social activism, was born in Maryland, a state known for its rural farming areas. Yet he ended up in Detroit practising his agrarian skills, and Earthworks now has the potential to transform his adopted city by creating one thing the city needs more than anything else: a way to make a living. Crouch is developing a "model plot" that consists of rows of vegetables, some beehives and a compost heap. He believes that with hard work the model plot could be replicated on individual lots across the city and provide owners with the means to produce an income of perhaps $20,000 a year. In Detroit that wage could be nothing short of miraculous. "This garden could be replicated and turned over for profit. That's the goal. It could provide a living wage," he says. The strange thing about Detroit is that the soil of its urban landscape is capable of supporting farming even after more than a century of urbanisation. Though many factory sites are contaminated, the land under the city's houses is often not. Crouch has tested the soil that Earthworks farms, and though frequently poor in nutrients, it's usually not polluted. Now, with each round of farming, harvesting and composting, it's improving every year. Earthworks' crops of vegetables and fruits are even certified organic. There are even more grand plans afoot elsewhere. Mike Score, president of Hantz Farms, has a vision of something that no other modern city has ever attempted: running full-scale commercial farms. Operating out of a former factory, Hantz Farms – the brainchild of John Hantz, one of the last remaining wealthy white financiers living in the city – is planning a wholesale transformation of the landscape and the creation of a proper agricultural industry. Score sees a future for farming on a large scale, on city land cleared of houses and their residents, with abandoned factories turned into hydroponic operations full of tomatoes and other crops planted all year around in artificial climates. The business could create the jobs, taxes and income that no other industrial sector in the city has provided for years. "This is a once-in-a-lifetime opportunity to reshape Detroit," says Score. "Small-scale farming cannot create jobs. We believe we can do that. We can make all the difference." There is certainly enough land. Abandoned houses, vacant lots and empty factories now make up about a third of Detroit, totalling around 40 square miles – the size of San Francisco. Walking around the rows of houses surrounding the Hantz offices, Score envisions a landscape dominated by agriculture. With his black cowboy boots and a lilting accent that seems to hint at the South, he looks an unlikely visionary for urban Detroit as he describes vegetable plots, fields and greenhouses, all the while wielding a hefty stick to keep away stray dogs and looking at burnt-out houses sometimes used as crack dens. In among the ruins there are a few rows of neatly kept homes where brave residents continue to cling on, but Score does not see their presence as a problem. "We are not like a developer like Walmart, where we need the whole block of land to develop a new store. If someone is still living in their house and doesn't want to leave or sell, that's OK," he says. "We can just farm around them." Score's project is not idle fantasy: Hantz Farms is expected to begin farming on a 40-acre plot in the city soon. It will be the largest urban farm in the world, and if it is successful other Hantz programmes will be implemented, and commercial farming will have begun within a few miles of downtown. This has certainly caught the attention of cash-strapped local government. Detroit mayor Dave Bing is currently working on a blueprint for the city's future, to be announced in the next 18 months, which is expected to involve concentrating Detroit's remaining residents within still-viable areas and abandoning neighbourhoods that are considered past the point of no return. The effect would be to create "nodes" of urban population surrounded by large stretches of land, likely to be largely empty. Detroit would become a more modern city, with many of its derelict and isolated buildings torn down. Its citizens could work a mix of rural and urban jobs, their health and diets nourished and improved by their own city's crops. Hantz Farms believes its large-scale farming would fit in perfectly with such a scheme. Yet a big commercial operation like Hantz is not without critics. Community groups and some urban farming activists distrust the corporation's profit motive, accusing it of attempting a "land grab". Such criticisms are shrugged off by Score, who sees his commercial farms operating side by side with community organisations. "I don't see why it has to be an either or option, " he says. "We can both coexist in changing the city and turning it into something else." To some extent this is already happening. A city-wide alliance of non-profit organisations is sponsoring the Shar Foundation, which aims to farm up to 2,000 acres in 15- to 30-acre pods: like Hantz Farms' plans, these will be run as agricultural businesses. Urban farms are already springing up in similar faded urban giants of the "American Rust Belt" such as Cleveland and Buffalo. Nor is the idea limited to troubled post-industrial cities: it's taking hold in vibrant metropolises like New York and Los Angeles too. Sevelle's organisation, born in Detroit, is now helping to set up urban farms and gardens nationwide. "We are doing this in more than 25 cities across the US and abroad," she says. It is possible that the future of cities is being born in Detroit. If so, that is a vision that Wieske, the genial beekeeper, is happy with. As he drives to his hives, he disturbs a wild pheasant with his car and it bursts into the sky in an explosion of feathers – a scene common to rural America but rarely associated with an inner city. "We get pheasants around here all the time," he says. He smiles and recites the unofficial slogan of Detroit's urban farming revolutionaries: "We are turning Motown into Growtown."